Through our experiences after the loss of Ryan, we found the support network for families of those who have lost loved ones to pediatric cancer to be severely lacking. We were happy to discover the much needed work that Camp Sol does and are extremely proud to pledge our support to Camp Sol and The Camp Sol Family Retreat Weekend. This twice a year retreat encourages families to connect with other grieving families as well as heal together through their shared experiences. The retreat also provides support groups and specific programming for children, parents and the family, and traditional camp activities to facilitate family bonding. Children’s Medical Center performance for Children’s patients. Ryan Goldblatt loved playing games, watching TV, building with blocks and reading books. These activities took up quite a bit of his time when he received his chemotherapy treatments for hours on end over the course of 2-and-a-half years. One of his favorite books was How I Became A Pirate which was read to him seemingly a thousand times. When it was discovered that Dallas Children’s Theater (DCT) would be performing How I Became a Pirate on stage, there was no question that Ryan would have to attend the play. It was no surprise that Ryan loved the performance and talked about it for weeks after seeing the show. After the Ryan Goldblatt Foundation (RGF) was formed, it seemed only natural to partner with DCT to provide theater tickets to the kids fighting cancer and their families at Children’s Medical Center (CMC). The goal was to give the children and the parents an experience they otherwise would probably never give themselves; to enjoy an afternoon together without having to think about doctors, nurses, chemo, medical bills, or anything cancer-related if only for a couple of hours.In addition to providing theater tickets to the kids who are well enough to go out and see a play on the big stage, the RGF also provides theater entertainment to the kids who are too sick to leave the hospital. The RGF underwrites several promotional appearances a year at CMC by DCT. 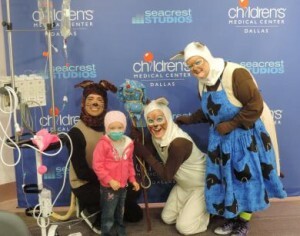 All of the kids in the hospital can come down to The Ryan Seacrest Studio at CMC and watch a play live, as well as obtain autographs and take pictures with the characters from the play. The patients also have the option of tuning their TVs to the hospital network and watching the performance in their room live as well. We are proud to continue our ongoing financial support for the amazing work being done at The Pauline Allen Gill Center for Cancer and Blood Disorders at Children’s Health℠ by their remarkable staff. The Gill Center is a world-class pediatric treatment center recognized nationally for exceptional clinical care, leadership in pediatric cancer research and academic excellence. The Center’s achievements in clinical care, research and teaching positions Children’s Health as a national leader in diagnosis and treatment of pediatric cancer. Since 1967, Children’s Health has cultivated a long-standing affiliation with University of Texas Southwestern to create a center with the highest commitment to serving its patients as part of the Division of Pediatric Hematology-Oncology at the UT Southwestern Medical Center at Dallas.